Burton Hands paints primarily with oil paint in an impressionistic style. 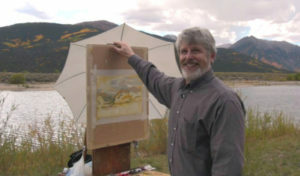 Whether his subject is a landscape, figure, or a still life; the rhythmic strokes of his brush applied rapidly to his canvas, result in paintings with vibrant colors that capture the fleeting effects of rays of sparkling sunlight and cool interesting shadow patterns.The Colorado artist loves painting American landscapes, but he also frequently travels to Europe where he particularly enjoys the challenge of plein air painting in new locations. His belief that the Impressionist movement was the last great movement in art has only been enhanced by his painting in the footsteps of Monet and the other masters of French Impressionism. That would include American painters John Singer Sargent, Mary Cassatt among others who studied and worked abroad as well. None of my trips to Europe have been sightseeing ventures, just to go some place interesting. Although, fascinating it has been. There is a deep thread of connection between our worlds that we have allowed to become frayed to the point of breaking it seems. It’s probably way past time for each of us to examine just where our place is in restoring that very worn thread of civilization that has been so very good to us. This connection is what really is the inspiration of all these paintings I’ve created from my travels to Europe. I hope these paintings communicate the value of that connection to those who see them. Hands has studied with some of the finest artists that have been associated with the Art Students League of NYC and the American West. Hands has received many national awards and has been included in exhibitions in NYC, Washington, DC; Jackson, WY; Santa Fe, NM; Scottsdale, AZ; Carmel, CA and Genouilly, France. Hands is represented in Oklahoma by the Howell Gallery.